We get it – you’d love to see Fraser Island and Rainbow Beach in its entirety – which you can’t do unless you have an off road vehicle. The Cooloola Coast is a veritable high suspension playground with perfect surf beaches, bush walking tracks, para-gliding and sky diving activities. Swim with dolphins, dive with Grey Nurse sharks or take a plunge in the ocean on horseback discovering more than 200kms of beach trafficable coastline. IT IS AMAZING. It’s not just about Fraser Island when it comes to beach driving. You can also explore Noosa North Shore along the Sunshine Coast’s Teewah Beach destination Rainbow Beach. The beach trip takes approximately 45 minutes and is gaining world-wide attention as one of the most spectacular things to do while holidaying in South East Queensland. There really is no other place or opportunity like this one. Either take your own vehicle, hire one or board the local shuttle service return from Maroochydore airport which also specialises in half day Rainbow Beach tours. Rainbow Beach Adventure Centre 4WD Hire is a family owned and operated business and has been in the industry since 1999. With that in mind we’d like to think we have half an idea when it comes to all things off road hire vehicles and service. 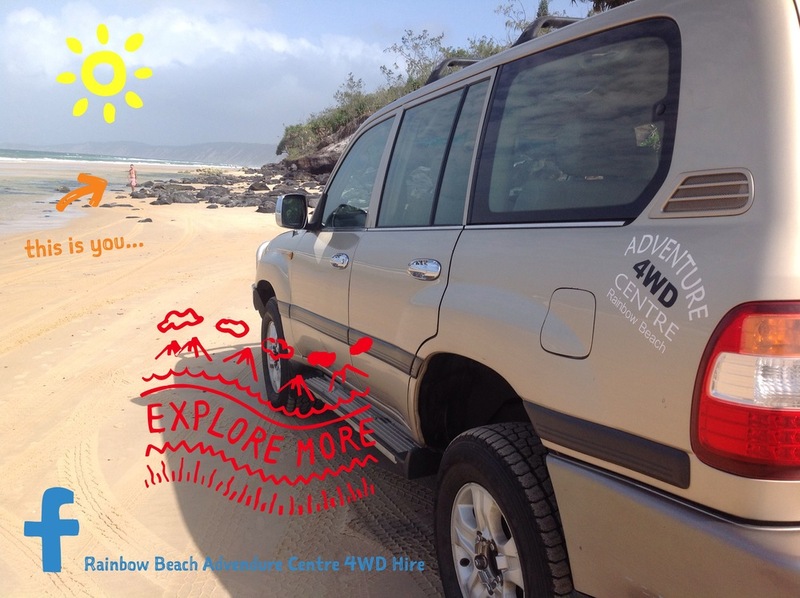 Most of our visitors have never been on Fraser Island and equally most have never driven a 4×4. Many originate from central and northern Europe as well as north America and of course Australia and it has to be said people do have high expectations when visiting this incredible biosphere. Well we can happily report we have never, and we mean never, had anyone say that they didn’t have one of the most amazing experiences of their lives. It’s on the bucket list must for most. We certainly know our vehicles and what they are capable of and ensure personalised itineraries, including our own maps with tidal information, are provided. We also take our guests on individual driving demonstrations so that they are familiar with how the vehicle operates and the difference between engaging high range 2WD and 4WD and low range 4WD. It is crucial that our guests understand the implications of driving at incorrect tidal windows with the noted guideline two and half hours either side of low tide generally provides beach trafficability up to six hours per day. As far as untrafficability is concerned the reverse applies where two and half hours either side of high tide the beach is untrafficable. In simple terms we provide beach ON and OFF times so relatively straight forward. The vehicles’ tyres are also pre-deflated at 22psi providing our guests instant ease when accessing the soft sand. Deflating tyres is also very important as this creates greater surface area in the tyre. Even if engaged in low range 4WD the chances of going nowhere in a hurry on road pressure tyres is a certainty. Logging was started on Fraser Island in 1863 by ‘Yankee Jack’ Piggott and continued until December 1991 when the island was nominated for World Heritage listing. The first trees taken by the loggers were kauri pine, hoop pine and cypress pine. In the early 1900s hardwood species such as tallowood, blackbutt and brush box were targeted. In 1925 satinay became the major timber logged on the island after it was found to be resistant to marine borer and became popular for use in marine conditions around the world. Satinays, logged heavily in the Pile Valley area, were used to line the banks of the Suez Canal and to rebuild the London Docks after World War II. Central Station, a former logging camp, is now a Queensland Parks and Wildlife Service ranger information station and interpretive centre. Some of the old loggers’ houses are still there. A walking track takes you to Wanggoolba Creek which is easily accessed by a board walk and the creek is home to the magnificent giant King Fern. Further excellent examples of kauri pine, brush box, Fraser Island satinay and piccabeen palms can be found here. This active mobile sand blow has covered a vast established forest area. As the sand blow changes with wind direction it uncovers ancient forest as it moves across the island and takes its name from the Aboriginal stone tools found there. This spectacular gazetted highway on the eastern side of Fraser Island not only stipulates regular road rules but also requires right of way light aircraft landing at the landing strip at Eurong. Plenty of birds of prey and sea birds migrate here throughout the seasons and of course the dingoes are a highly sought after photo opportunity. Built in Scotland in 1905, the luxury cruise ship Maheno sailed between Sydney and Auckland. She was one of the first turbine-driven steamers and one of the fastest ships of her time, setting a record for the quickest crossing of the Tasman in 1907 (two days 21 hours). During World War I she was commissioned as a hospital ship in Europe and also served in the Mediterranean and the Red Sea. After the war the Maheno was recommissioned as a cruise ship. On July 8 1935 while being towed to Japan for scrapping the Maheno was struck by an out of season cyclone and washed ashore. During World War II the wreck was used for air force target practice and by Z Force special unit who practiced planting limpet mines on her prior to the raid on Singapore Harbour. Fraser Island has a wide variety of plant communities growing in sand and ranging from coastal heaths to subtropical rainforests. The plants find nutrients from thin coatings on the sand grains and from the decomposed leaf litter (humus) on the forest floor. Coastal Heaths grow in the harsh conditions on the eastern side of Fraser Island and have to contend with strong winds, salt spray, sand blasting and limited fresh water. These plants help to stabilise the sand and start the nutrient cycle. Common plant species include beach spinifex, angula pigface and horsetail she-oak. Eucalypt forests are found across most of Fraser Island. Open scribbly gum forest dominates in the drier areas of the island. The trees have pale bark covered in what looks like graffiti. This is caused by moth larvae making shallow tunnels under bark which later peels off. Tall blackbutt forests with an understorey of small shrubs are found in the wetter areas of the island. Satinay and brushbox dominate the edges of rainforest in what is known as a transition forest. The understorey often contains rainforest species. Rainforests grow on sand dunes at the world’s highest elevation being more than 200 metres. Subtropical rainforest can be found in the centre of the island in the wetter gullies. These communities have a thick canopy of leaves allowing minimal light to reach the forest floor. This causes the trees to grow tall and straight to reach the sunlight making the trees suitable for logging. Kauri pine and the piccabeen palm are common species found in the rainforests. Wallum heath lands dominated by the wallum banksia and featuring sedges and grass trees are known for their colourful wildflowers which are in full bloom in spring. Heath lands can be found on the drier ridges and high plains. Fraser Island is home to many different animals, however, most are nocturnal and rarely seen. The most obvious mammals on the island is the Dingo. There are estimated to be 150-200 dingoes on Fraser Island living in all habitats. Although they appear similar to a domestic dog they are closely related to the Asian wolf. Dingoes on;y produce litter of about 4-6 pups each year in August. Fraser Island’s dingoes are amount the most genetically pure dingoes in Australia. There are 47 other species of mammals on Fraser Island including the swamp wallaby, small eared mountain possum and the sugar glider. More than 350 species of birds have been sighted on Fraser Island. The island has a wide range of habitats providing different food sources, nesting and breeding areas. Fraser Island is also a resting and breedign ground for migratory birds some from as far away as Siberia. Fraser Island is home to 79 species of reptiles including 19 snake varieties. The most commonly seen reptiles are the sand monitor and the lace monitor. These large lizards are often seen around the picnic areas looking for scraps. Dolphins, dugongs, turtles, rays and between July and November migrating humpback whales frequent island waters. Rare frog species such as the “acid” frogs which have adapted to survive in a difficult environment can be seen and heard in the swamps.